Hotel will reserve event space up to 24 months in advance for all Saturday weddings. The demand is extremely high for spring and summer weddings. 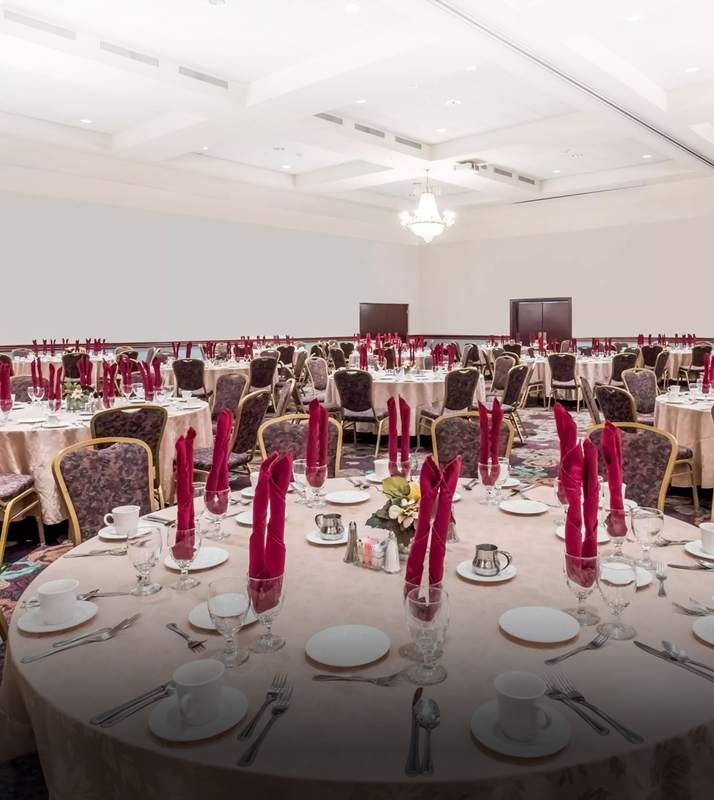 Please note that we cannot accommodate all requests and therefore suggest that individuals have an alternate date in mind or consider alternate banquet rooms for their event. Discounted pricing is available for Friday and/or Sunday events. Menu Pricing is guaranteed 6 months in advanced; please note that current pricing may not be applicable to your booking date. Each of our banquet rooms, requires a wedding package with a minimum number of guest for their use. Following are the use requirements for each of these rooms. *Taxes and Service Charges do not count towards minimum purchase requirements. A: Our Wedding Packages offer complete deluxe receptions, including bar, with champagne toast, hors d’oeuvres, overnight accommodation for the bride and groom as well as sit-down or buffet dinner options. Please note; additional 6% Sales Tax and 18% Gratuity will apply to all food & beverage pricing. A: A non-refundable deposit of $1000.00 is required to reserve your space. An additional deposit of 30% of the total estimated cost will be due 4 months prior to your event and final payment is due 3 business days prior to your event. A: Some of our wedding packages include two hours of continuous open bar, others in cash bars. Extensions are available at your request for $8.00 per person, per hour (minimum of one hour) based on the guest guarantee. You may also offer to extend the bar based on consumption. You may be charged according to the number of drinks consumed. Q: Do you accommodate early check-in? A: Please note that no check-ins can be confirmed prior to 4pm. In order for any early check-in request to be guaranteed, the room must be reserved and paid for the night before to ensure the room is clean and available upon your arrival. Q: Will my overnight guests be assigned rooms in the same area of the hotel? Q: Does the hotel offer a shuttle for guests? A: Yes; we offer a complimentary hotel shuttle to and from the airport. Guests must schedule shuttle service in advanced. Q: How far in advanced can I book my reception? A: For all weddings, the hotel will confirm space up to 24 months prior to your selected date. Q: What if I’m interested in booking space more than 24 months prior to my event? A: Prospective brides who are interested in a particular date more than 24 months in advance are welcome to submit a letter indicating their interest in booking space on such date. Preference will be given to the first bride who submits their letter of interest first. Please note that we cannot accommodate all requests and therefore suggest that individuals have an alternate date in mind or consider alternate banquet rooms for their event. A: The hotel offers complimentary use of round mirrors & glass fishbowls. All personalization of centerpieces is the responsibility of the couple to provide. Up to three votive holders (candles not included) are available upon request. Please note; hotel policy prevents open flame centerpieces. A: Your catering manager will introduce you to the Banquet Manager on Duty and your Event Captain. The Captain is responsible for the operations during your event and serves as the liaison between you and the chefs to ensure a smooth-running reception.